Today is Thankful Thursday. V picked the first tomatoes of the season from the garden. I don’t like tomatoes unless I can hide them deep inside something, but I do like tomato sauce, LOL. I was informed that this year’s crop is extra-ordinary! I am thankful for the fruits of the field, even the one’s I don’t eat. This was Muffin (RIP), on the first crop a few years back. The current cats (Noel, Nine, & Stella) only like to bat the toms around and use them as toys. The Muffin Man (aka Muffy, Muffin, Mr. Wonderful) was an extraordinary cat, just like this year’s crop. Do speedy rabbits like toms? Very sweet post…love to Muf…and you! Muffin will be remembered. Our Tzitzush will be remembered. They come and go, but they will stay in our hearts. We’ve never tried tomatoes but Jan loves them. In fact you just reminded her she needs to walk to the store to find some. Fresh tomatoes from the garden, yummy! Love your picture too. With Potato Chips on the side? Thanks. He was a good boy. 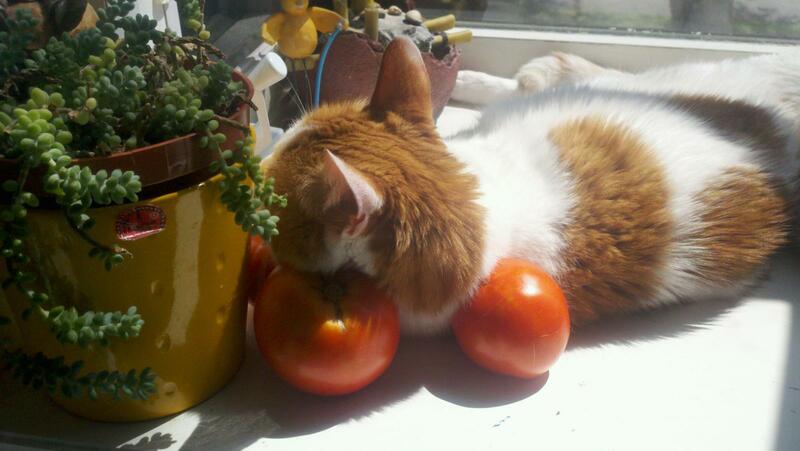 looks like those tomatoes make a great head rest!